Hmmm – Did you leave it to rise for over 8 hours???? We could do a bread intervention for you. Pehaps Seb could do a demo next time we’re around….I bet it still tasted pretty good, though. Right?? Um, it actually crunched when you bit into it. And I left it to rise for a whole 23 hours!!! Dad thinks the house was too cold and that next time I need to leave it next to the fire. Would LOVE a Seb demo. How puffed was the dough? 23 hours may have been too much, especially if you used fresh/new yeast. This is what Seb thinks. Over-proofed bread dough will collapse in the heat. 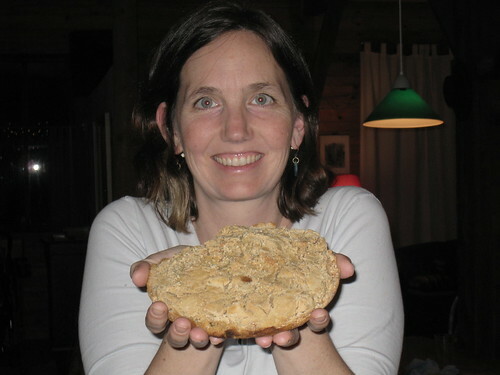 If it is over-proofed (really poofy/fluffy – risen bread dough), it is double in volume. We’ve over-proofed croissants and the bread crashes flat. If your yeast was fresh, it may have been very active and strong – allowing it to over-proof more easily. Maybe try to let it rise for 8 – 9 hours max next time. Just mix the dough before you go to bed, put in plastic tupperware, and bake in the morning. crusty: that is the no-knead bread recipe i use (well, the one from the Times). we all knead to pray now. Hehehe. I made this recipe and left it for more than 24 hours and it worked fine. I think it must be the cold house! Oh Em. I sorry your bread came out so crummy.